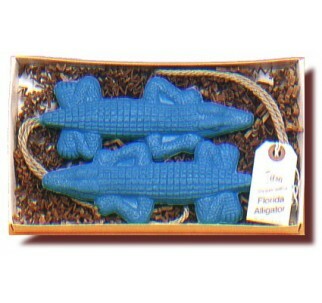 Do you have the nerve to shower with a Florida 'gator? Well.... how about two??? Here's the perfect gift for "Gator" fans everywhere! One of our lazier buyers found this twin alligator s.o.a.r. gift set appropriately enough while vacationing in the Sunshine State. These cute and sudsy reptiles are just 'hanging around' in a bed of confetti grass waiting for the next unsuspecting bather! So double your pleasure and your fun by ordering this dynamic duo for the shower. 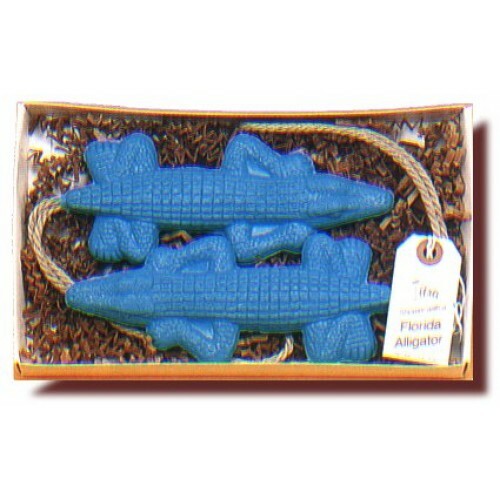 Each alligator soap-on-a-rope is made by hand and comes in brilliant Florida blue!